The following is a follow-up to the blog Global Food Industry Reluctant Leaders of Smallholder Farming Revolution posted 04/01/2015. One-third of the world's population holds the key for the rest of us. One-third of the world's 7.3 billion people are smallholder farmers and their families who produce nearly 70 percent of all food consumed worldwide on 60 percent of the planet's arable land. For what sounds like a major part of the global economy, you would expect these farmers to be relatively well off and financially secure. But they aren't. In fact, they represent the majority of the poorest and hungriest people on earth. How did this happen? It began with a global food scare in the early 1960s. Experts predicted the world population would exceed our food supply by the 1990s, based on production levels at the time. The answer was a massive increase in industrial farming to produce huge quantities of cheap grain using hybrid seeds and chemicals. It worked, and there is no question that a major crisis was averted. About the same time as the initial food scare, rich countries began giving foreign aid to developing countries to improve their economies and reduce poverty. Part of the deal was that recipient nations had to agree to reduce support for domestic smallholder agriculture and encourage their citizens to buy cheap imported grain from industrialized farms in the countries giving the foreign aid. The combination of a vast increase in industrial farming and greatly reduced support for agriculture in developing countries led to smallholder farmers becoming invisible. Today there are 2.5 billion people who live and work on 500m smallholder farms, each less than two hectares (five acres). They represent one- third of humanity, yet they have been systematically ignored and marginalized for 60 years, while industrial farming has received the benefits of agricultural research, subsidies, trade agreements, tax credits and regulatory systems. Experts are now telling us there will be two billion more people by 2050, but not enough food to feed this increased population if we stay at current production levels. Almost all of these new people will be born in low-income countries where most food is produced on small farms. In an ironic twist, this new global food scare is putting smallholder farmers on the radar for the first time. The reason is that having reached the limit of arable land worldwide, our only option is to figure out how to increase yields on land already being cultivated. Given that more than half of all farmland is cultivated by smallholder farmers, they have become the new global food frontier. And they have found an unexpected ally. Major companies within the food and beverage industry, typically for strictly business reasons, have begun procuring from millions of smallholder farmers throughout the developing world. In less than a decade, this market-based partnership between smallholder farmers and mammoth corporations has done more to benefit the farmers -- albeit with some missteps along the way -- than 60 years of foreign aid. The food and beverage industry is now in a leadership role they did not ask for. More significantly, they are in a unique position to be the catalyst for a global course correction that goes beyond just helping smallholder farmers. The farmers themselves need training, better seed, good tools and access to markets and financing. Responding to these needs will have a measurable output in the form of increased yields, but the actual impact will be beyond measure. This is because it turns out that these 2.5 billion farmers finding solutions for smallholder farmers means finding solutions that engage one-third of humanity in addressing food security, climate stability, biodiversity conservation and rural employment. It is estimated that there are over 3.5 billion hectares of degraded, eroded and desertified lands worldwide, an area larger than Africa. Incentivizing small farmers to restore this land could have global impacts in terms of climate and conservation. Farming methods that increase soil organic carbon and restore vegetative cover, for example, could substantially mitigate climate change, according to leading experts. To the executives, staff, distributors, agents, shareholders and customers who together constitute the world's largest food and beverage enterprises: you are challenged to move beyond a de facto role and assume conscious leadership of a worldwide campaign in support of smallholder farmers. To get started, here is a campaign platform for consideration. A simple rule: do not start anything with smallholder farmers unless you are certain the benefits will continue after you leave. If you start purchasing from them, what happens when you stop? If you begin to provide training, seed and tools, what happens when you leave? If you expand local production based on exports, what happens when you find a cheaper source elsewhere? The developing world is littered with the carcasses of dead agricultural projects that ended the minute the funding or purchasing stopped, almost always because they created dependency rather than built capacity. Most smallholder farms are organic, even if that is by default rather than by design. As the true environmental cost of industrial farming takes its toll, why not invest in a global environmental insurance policy by helping smallholder farmers to double or triple output using improved organic methods? A little funding for research would help here, given what has been spent to date in support of industrial farming. The farm-level cost of agricultural training, better open-pollinated seeds and high quality tools will be offset by increased yields and profits. Higher yields will help to meet increasing consumer demand for organic food, while higher profits will make agriculture attractive and reduce urban migration. Women share the workload on smallholder farms, but tend to have less say in their operation and receive little of the income. But when women are included as equals, productivity almost always goes up. Women are more likely than men to invest their increased income in the long-term interests of their families and communities. There is no shortage of data to support these claims, but not nearly enough examples of action. There are three initial areas that will make a real difference. First, ensure that women get equal access to agricultural training. Second, make micro-credit widely available to female farmers. Third, help women set up cooperatives and small businesses to process food into sellable products. Agriculture and trees are closely linked. Having reached the limit of land suitable for agriculture, forests are being cut down at the rate of 66m hectares (165m acres) a year to create more cropland, mostly for industrial farming. With a bit of training, smallholder farmers are very adept at agroforestry -- the combination of fruit and other productive trees and field crops -- particularly because it tends to be labor intensive. When combined with improved agricultural techniques, the result is more food and more trees, not to mention less pressure to cut down forests. This is particularly important because if we keep going as we are now, feeding two billion more people is projected to require cutting down two billion acres of forest. Purchasing from smallholder farmers for export is great, but only if it is balanced with local production. If agriculture is geared only to export, it puts the farmers at risk if they are suddenly cut off from oversees markets and the monoculture they have been exporting is higher in volume and price than can be absorbed by local markets. And any export commodity that leads to the total exclusion of local food production should be a criminal offense. A market-based approach is showing results in improving the lot of smallholder farmers, but to really take this to scale will require additional resources. The food and beverage industry should challenge donor governments to redirect a significant portion of the foreign aid they now spend unsuccessfully on agriculture in developing countries -- to fund incubation grants aimed at helping groups of smallholders transform themselves into self-financing, self-managed small businesses. The process of certifying farmers for organic and fair trade labeling is critical for getting access to foreign markets at premium prices, but the cost is exceptionally high throughout the developing world. Lowering these costs without lowering standards would be a great challenge to put before the international community. 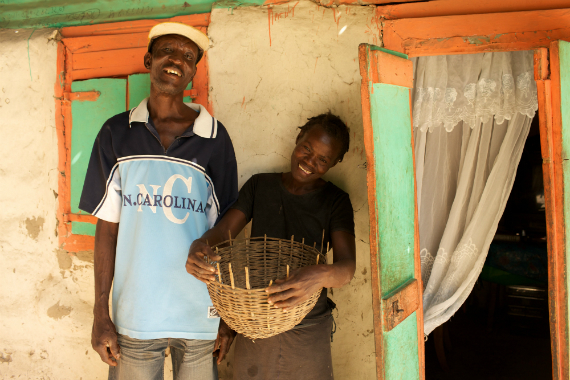 These ideas are the result of working for the past five years with 3,200 Haitian smallholder farmers (and with support from the Clinton Foundation and Timberland) who are pioneering a new market-based approach, using trees as bio-currency to pay for doubling food production while significantly improving farm livelihoods and communities. 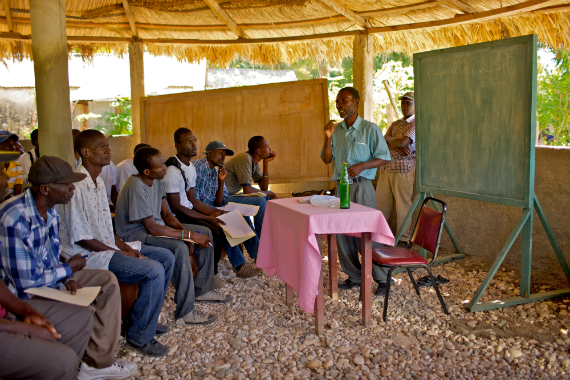 If it can be successful in Haiti, it can work anywhere. This is part two of the blog Global Food Industry Reluctant Leaders of Smallholder Farming Revolution posted 04/01/2015. Hugh Locke is the Co-Founder and President of the Smallholder Farmers Alliance.